The month of July will prove to be a period of free-agent frenzy. On Thursday, the NBA Draft will become the start of many perceived moves to come. There are a number of teams looking to make deals for top level draft picks. The hot topic currently trending in the NBA is the proposed deal between the Golden State Warriors and the Minnesota Timberwolves. Minnesota is offering to trade All-Star power forward Kevin Love and shooting guard Kevin Martin to the Warriors for aging power forward David Lee and young rising star Klay Thompson. The Wolves would also receive the rights to Golden State’s 2014 draft pick. Kevin Love is definitely a top level NBA performer but are the Warriors really able to break-up the best shooting backcourt in the league with a clear conscience? There have been reports saying, “The organization is split in regards to initiating the trade”. The combination of Stephen Curry and Klay Thompson is one that should be allowed to grow together, regardless of Love being available to the Warriors. When the smoke clears, I Believe Kevin Love will finish his final season with the Minnesota Timberwolves. He will be strongly pursued in the summer of 2015 but ultimately, the Los Angeles Lakers will be his final destination. With Kobe Bryant in the final stages of his career, Love would be in place to be the next big star of the franchise. He is a California kid who grew up loving the Lakers which makes the possibility even more intriguing. Miami’s big three will all opt- in for one more season and hope the significant changes to come will guide them to another title. With only one player under contract for next season, Pat Riley will really have to work his magic. Building a significant foundation around the big three should not be difficult. Carmelo Anthony will take his talents to the Windy City. 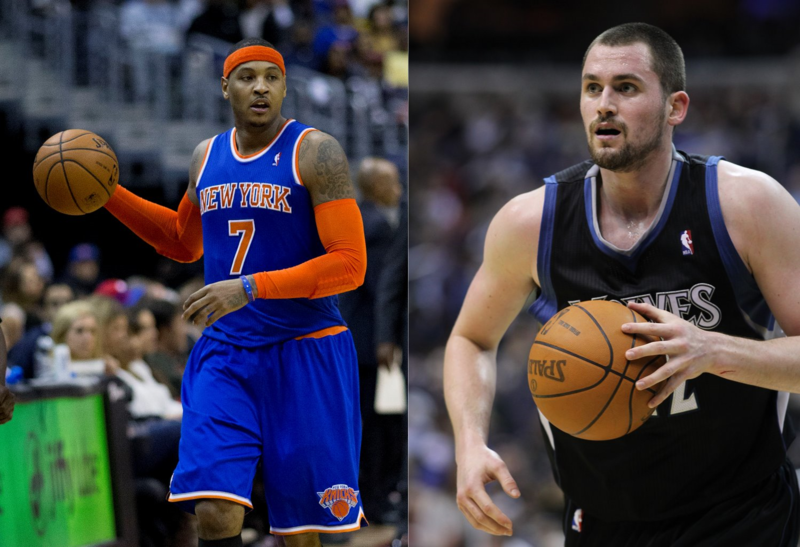 The Chicago Bulls are the best fit for what Carmelo provides. (Scoring) The lost of Derrick Rose and Chicago’s lack or resigning Nate Robinson and Marco Bellinelli, virtually killed their scoring punch off the bench. I believe the Bulls will amnesty the contract of Carlos Boozer and trade Mike Dunleavy Jr. to clear up cap space for Anthony. The key to the Bulls reaching a championship will depend on the health of Derrick Rose. If Rose can resemble the player he was before the leg injuries along with the addition of Carmelo, Chicago will be very formidable in the Eastern Conference.